^ Skennerton, Ian D., Small Arms Identification Series No. 9: .455 Pistol, Revolver No. 1 Mk VI, p. 6, Arms & Militaria Press, 1997. ^ Maze, Robert J., Howdah to High Power, p. 44, Excalibur Publications, 2002. ^ Dowell, William Chipchase, The Webley Story, p. 115. Commonwealth Heritage Foundation, 1987. ^ a b Dowell, William Chipchase, The Webley Story, p. 115, Commonwealth Heritage Foundation, 1987. ^ Dowell, William Chipchase, The Webley Story, p. 114, Commonwealth Heritage Foundation, 1987. ^ Dowell, William Chipchase, The Webley Story, p. 116, Commonwealth Heritage Foundation, 1987. ^ Dowell, William Chipchase, The Webley Story, p. 178, Commonwealth Heritage Foundation, 1987. ^ Maze, Robert J., Howdah to High Power, p. 49, Excalibur Publications, 2002. ^ Smith, W. H. B., 1943 Basic Manual of Military Small Arms (Facsimile), p. 11, Stackpole Books, 1979. ^ Stamps, Mark & Skennerton, Ian D., .380 Enfield Revolver No. 2, p. 87, Greenhill Books, 1993. ^ Stamps, Mark & Skennerton, Ian D., .380 Enfield Revolver No. 2, p. 117, Greenhill Books, 1993. ^ Stamps, Mark & Skennerton, Ian D., .380 Enfield Revolver No. 2, p. 119, Greenhill Books, 1993. ^ Stamps, Mark & Skennerton, Ian D., .380 Enfield Revolver No. 2, p. 9, Greenhill Books, 1993; Smith, W. H. B., 1943 Basic Manual of Military Small Arms (Facsimile), p. 11, Stackpole Books, 1979. ^ Maze, Robert J., Howdah to High Power, p. 103, Excalibur Publications, 2002. ^ Stamps, Mark & Skennerton, Ian D., .380 Enfield Revolver No. 2, p. 12, Greenhill Books, 1993. ^ Maze, Robert J., Howdah to High Power, p. 30, Excalibur Publications, 2002. ^ Dowell, William Chipchase, The Webley Story, p. 128, Commonwealth Heritage Foundation, 1987. ^ Maze, Robert J., Howdah to High Power, p. 78, Excalibur Publications, 2002. Dowell, William Chipchase, The Webley Story, Commonwealth Heritage Foundation, Kirkland, WA (USA), 1987. ISBN 0-939683-04-0. H.M. Stationer's Office, List of Changes in British War Material, H.M.S.O, London (UK), Periodical. Maze, Robert J., Howdah to High Power: A Century of Breechloading Service Pistols (1867–1967), Excalibur Publications, Tucson, AZ (USA), 2002. ISBN 1-880677-17-2. Skennerton, Ian D., Small Arms Identification Series No. 9: .455 Pistol, Revolver No. 1 Mk VI, Arms & Militaria Press, Gold Coast, QLD (Australia), 1997. ISBN 0-949749-30-3. Smith, W. H. B., 1943 Basic Manual of Military Small Arms (Facsimile), Stackpole Books, Harrisburg, PA (USA), 1979. ISBN 0-8117-1699-6. Stamps, Mark & Skennerton, Ian D., .380 Enfield Revolver No. 2, Greenhill Books, London (UK), 1993. ISBN 1-85367-139-8. Wilson, Royce, "A Tale of Two Collectables", Australian Shooter Magazine, March 2006. 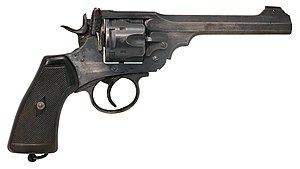 The Weapons Collection: Pistols Revolver, REME Museum of Technology.